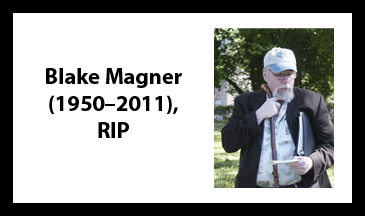 The late Blake A. Magner was born and raised in the great commonwealth of Massachusetts. After a four year tour of duty in the U. S. Navy, which included time spent in the Brown Water Navy in South Vietnam, he moved to New Jersey after meeting his life mate at a USO dance in 1971. Blake and his wife have now been married for thirty-six years and are proud parents and grandparents. Blake has a Master’s Degree from Rutgers University in Biology and worked through the 1980s as a chemist. Continually hearing the call of History, Blake left his Science profession and became an independent historian in 1990. His area of interest includes just about everything from the War of Jenkins’s Ear through the late 18th century, the 19th century and ending with the death of Theodore Roosevelt. He also has a working knowledge of the Normandy landings and the Vietnam War. His studies include military history (specifically the Civil War and Revolutionary War), literature, personalities, the Founding Fathers and politics. Blake recently retired as the Book Review Editor for The Civil War News. He has been studying the Civil War since 1962 with a specific interest in the Army of the Potomac and Army of Northern Virginia between August 1862 and the end of the Gettysburg Campaign. He has been a member of Old Baldy since 1981 and President in 1985/1986. Blake was the chairman of the General John Gibbon Memorial Committee that erected a monument to the general on the Gettysburg Battlefield in 1988. In 1991 Blake worked for the Association for the Preservation of Civil War Sites surveying battlefields for potential preservation. He has authored and co-authored a number of volumes including Battlefield Commanders: Gettysburg (with Mike Cavanaugh), Traveller and Company: The Horses of Gettysburg, and At Peace With Honor: The Civil War Burials of Laurel Hill Cemetery, Philadelphia, Pennsylvania. He is presently compiling an encyclopedia of the battle of Gettysburg which he hopes to have released on the 150th anniversary of the fighting. His newest work, The Civil War Quiz Book, was released in July 2010. His work has also appeared in Civil War Times Illustrated, Military Images, Gettysburg Magazine, and Blue & Gray Magazine. Blake is a Civil War cartographer and photographer whose work has appeared in nearly 90 volumes. He is also the owner of C. W. Historicals, a publisher of fine Civil War and related volumes.